Solomon told us that there is “nothing new under the sun,” and so it is. 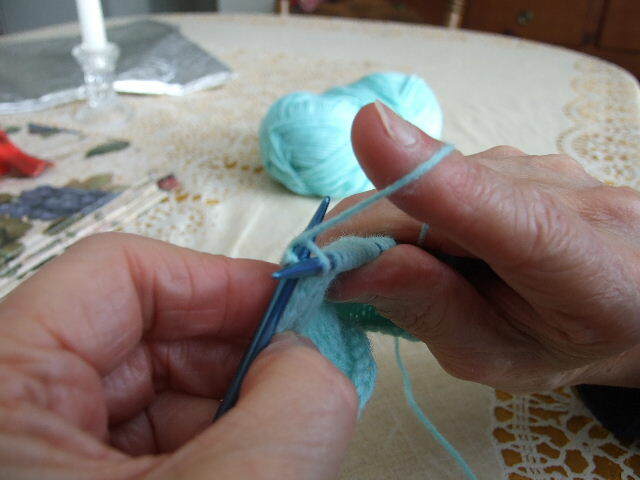 Unlike our grandmothers whose knitting techniques often remained regional, we have ability to research the contributions of knitters from all over the world. Yes, everything has been done before, so my joy is simply in making those new discoveries. Thus, the word “new” here is that it is new to me. And, having only been taught the basics of knitting as a child, all the new techniques offered by the ladies who freely display their expertise on the web, have been a real blessing to me. However, there is nothing I like better than tweaking a idea or a pattern, with the intention of figuring out how to do it better, or easier. That’s what keeps my creative juices flowing, and gives me the determination to learn new skills. This page will be my stage for presenting my ideas for your enjoyment, or laughter. The above picture is just a teaser. The ones in the tutorial are very focused, and show clear details, along with written instructions. You can view the YouTube version here. Here’s my story about knitting and Continental stitch. I want to share this to help other people who have struggled with Continental Stitch. Thank you very much for the knitting backwards tutorial, i had tried it once before on the “summit shawl” but that was only over 11 sts at a time. After looking at your very clear diirections i feel confident enough to try it on a baby sweater.